Kudos to Stan Gelber & Sons Heating & Cooling of Uniondale, NY. Never heard of them? Neither did I…until I got this direct mail piece from them. Of course, all my snail mail marketing usually goes right in the trash (sorry, if you’ve sent me any)…but this darned dog caught my eye on its journey into the wastebasket. I fished it right out, thinking…why is that dog wearing a hat and scarf? Then, I actually read the entire card, front and back. And then I thought…damn. They got me. 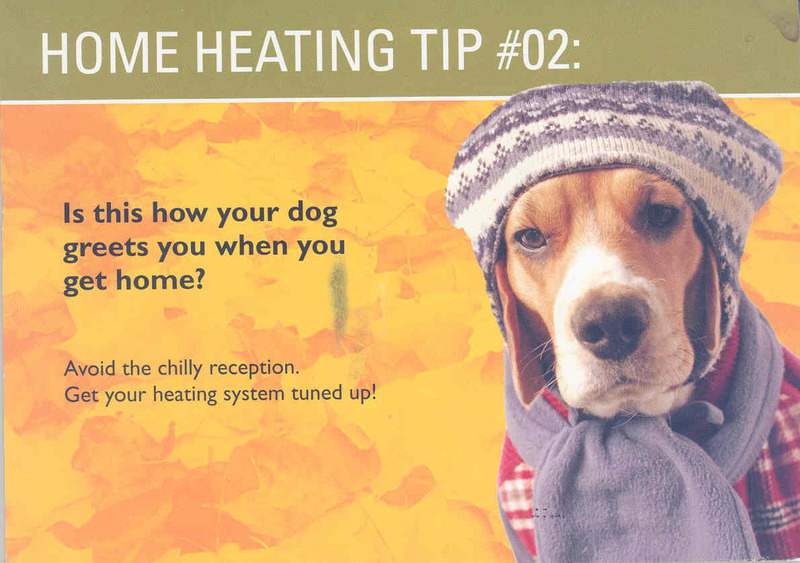 I don’t often think about heating or cooling systems…heck, I don’t even have a dog. But this card suddenly made me wonder if my heating system is ready for the winter. What arrested my attention was the element of surprise. Even if you think it’s goofy, you cannot help but smile (c’mon, admit it) and be a little curious about this photo. The point is: it broke through the clutter. Five other direct mail marketing pieces went right into the trash at my house that day, but this one got fished out. Your lesson from this? Before you can even begin to market to someone, you’ve got to get their attention. And who doesn’t love a good surprise?